Figure: Hitting a ball with a hand or fist against a wall. 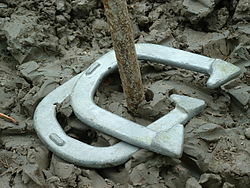 Organisation: Horseshoe Pitchers association of Ireland. Figure: A men is focusing himself on touching the ball (sliator) with a hurley. Figure: A man tries to throw a metal ball as far as possible. This traditional sport is also known in certain region within the Netherlands (klootschieten), Germany (klootschiessen), and Italy. Figure: Demonstration of Rounders, a bat and ball game different from baseball.